Blanca actually belonged to the generation of poets prior to the one I was most interested in (the "Generation of the 1960s"), but she was closely involved with the writers emerging in the 1960 and 80s as a linchpin of the Lima intelligentia. 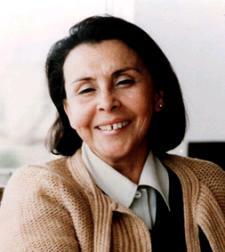 She represented Mexico's publishing house Fondo de Cultura Económica whose office was a compulsory waysation in Lima's literary circles. She mixed it up with Latin American intellectuals, including Octavio Paz, Ernesto Cardenal and Julio Cortazar. She was married for a time to Peruvian painter, Fernando de Szyzlo. In the past couple of decades, she earned recognition as a precursor feminine voice in Latin America. Blanca was actually the first poet to help me by reviewing my translations. Even more magnanimous, she was genuinely encouraging about my own writing, especially a poem called Solar Plexus. I was saddened to find out that she died on March 12, 2009 at the age of 82.